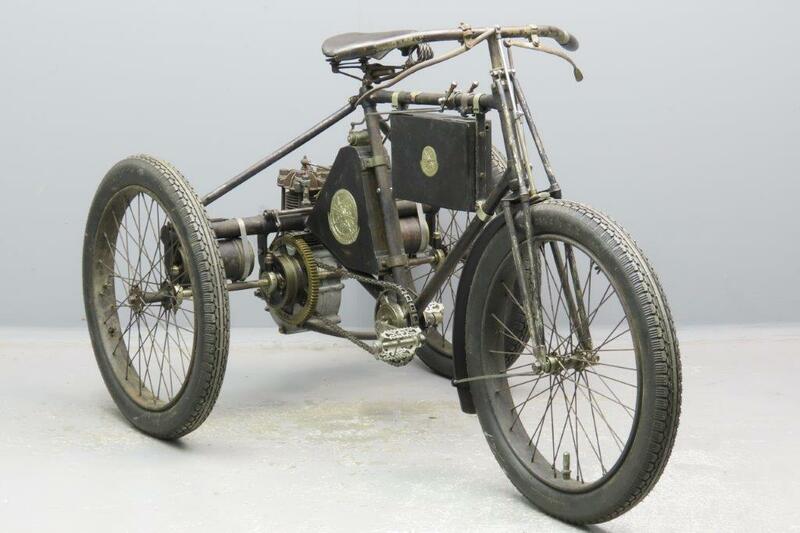 The De Dion-Bouton motor tricycle went into production in 1896 weighing just under 80 kg, with an output of about 1 ¼ HP from its 187 cc motor. 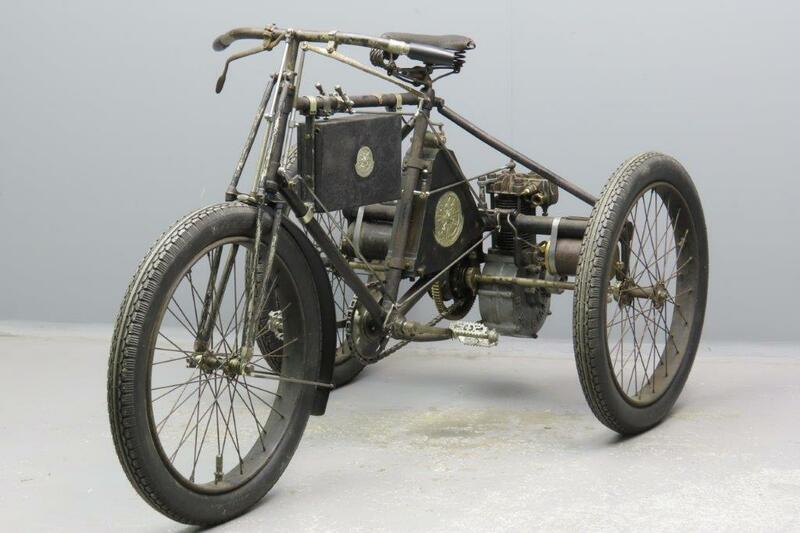 The tricycle with track width of 92 cm was chosen, because according to De Dion and Bouton “a bicycle appeared too fragile for this purpose”. 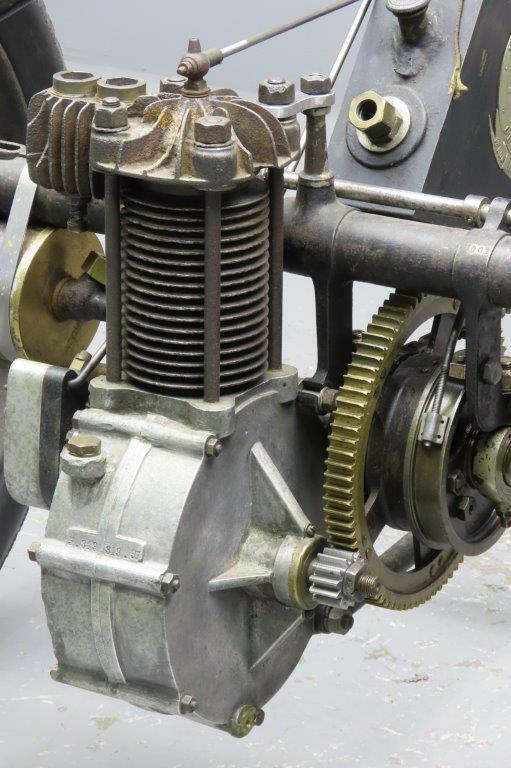 The drive was achieved via a pair of gears from the engine directly to the rear axle. A differential balanced the different curve radii. 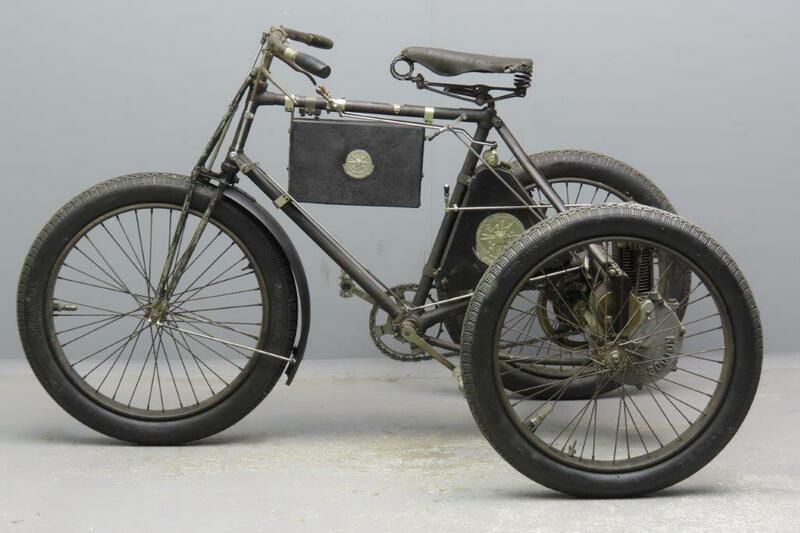 The motor tricycle remained in continuous production for almost ten years. The last model (1904) had a 955 cc displacement engine (bore 100 mm, stroke 120 mm) producing 8 HP at 1,800 RPM. 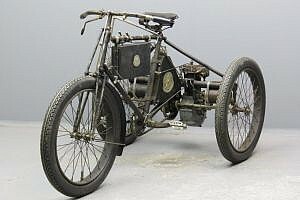 On April 13, 1902, the French racer Georges Osmont set a speed record of 109.1 km/h in Nice with a De Dion-Bouton motor tricycle. The DDB tricycle was the most successful motor vehicle in Europe from the late 1900s until the start of the 20th century and with about 15,000 copies sold, it scored the first breakthrough for the distribution of motor vehicles. 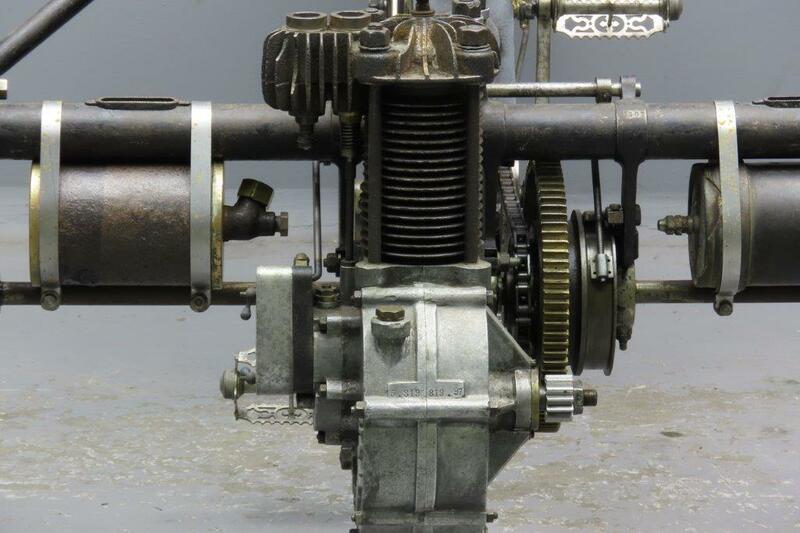 In particular the fast-running de Dion-Bouton engine set new standards for vehicular motors and is regarded as the precursor of all motorcycle engines. 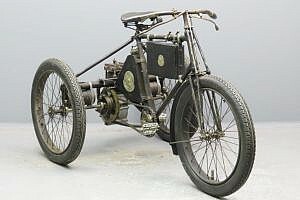 Year after year the design was improved and soon many manufacturers, big and small, introduced three wheelers, often with De Dion engines. Bouton found out that the glowplug ignition was the obstacle to higher speeds. He developed a high voltage ignition system for the engine with circuit breaker. The dry battery for the ignition is located in a rectangular box under the upper frame tube; ignition timing can be adjusted with a small lever. The side exhaust valve is driven via a gear-driven camshaft, and the intake valve is of the atmospheric type. The cylinder head is removable and bolted with four bolts, together with the cylinder, on the crank case. The weight of the cast iron / aluminium engine including all auxiliary units amounts to less than 20 kg. 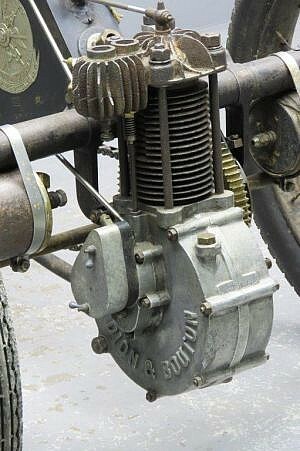 This rare very early DDB is fitted with an air cooled 239cc (66×70 mm) engine rated at 1¾hp and fed by a surface carburettor. 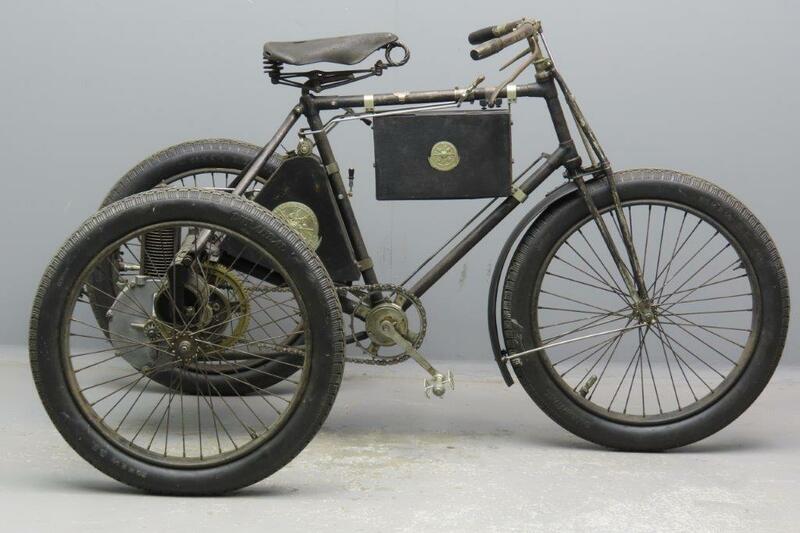 This gem is in good unrestored condition and will need only a little attention to get it up and running.